The giant stands, 8 feet tall, hands rigidly by his hips, surveying the surrounding forest. He is an outcast of his community, destined to be alone on this hilltop forever. When it is sunny his red body glows. And when it is cold ice forms on his ribs. To visit him you must make a great journey to the far reaches of Scotland, 100 miles north of Inverness to Borgie Forest. 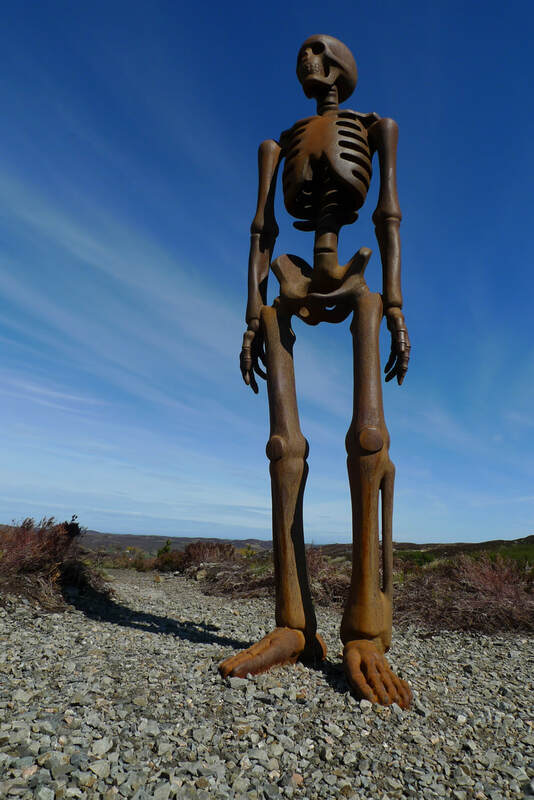 Here the road ends and you must proceed on foot and hike uphill in order to stand alongside this colossal skeleton. 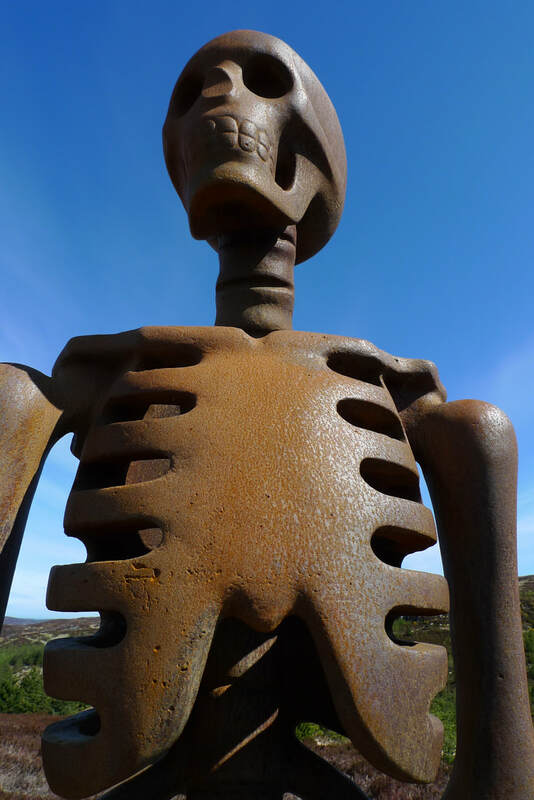 This sculpture, The Unknown, by Kenny Hunter, takes a bit of effort to reach, but is well worth it to experience impressive art in such a remote location. The Unknown is representative of the outcast figure that features so prominently in Scotland's history, people like William Wallace, Bonnie Prince Charlie and the families of the Highland Clearances. Paul and I cycled to Borgie Forest from the village of Bettyhill. We had spent the previous evening enjoying the comforts of The Bettyhill Hotel. The meal of haddock and chips followed by a chocolate torte with a biscuit base was delicious and lovingly presented. The breakfast of scrambled egg on crostini was perfectly done and accompanied by the hotel's most special feature, the spectacular vista of the bay. I noticed that the hills across the water were green and golden; golden because they were peppered with sand all the way to the top and I imagined powerful storms spraying the hill with the grains. I enjoyed my conversations with the hotel owner who told me of the challenges of renovating the building. He had bought it as a wreck and discovered pipes with gaping holes that were held together with electrical tape. The hotel had originally been affiliated with a petrol station and pointed out the stone shell emblem, representing a certain oil company, atop the gate posts. "Hotels like these had a petrol pump and rich folk came for the fishing. The barman used to work here as a boy, polishing the guest's shoes. They left them outside their door." I discovered an old floor plan of the hotel and one of the rooms was marked as a hairdresser. It was hard to believe that small highland hotels in remote areas had once offered such luxuries; a bygone era indeed. We loved the soft sands of Farr Beach where children laughed and played with an overexcited collie. We walked the length of the beach to where there are jagged rock formations and pebbles littering the space between them. I was struck by the variety of colours and patterns of these stones. I got down on my kness to pick them up, examine their swirls and stripes in detail and feel their smoothness. I loved the sound of the waves rolling them. In a nearby churchyard where a blackbird, high up in a tree, sung its heart out we marveled at an intricately carved Pictish stone. This is the Farr Stone, dating from the 8th or 9th century, and features a cross, illustrated evidence of the reach of Christianity. 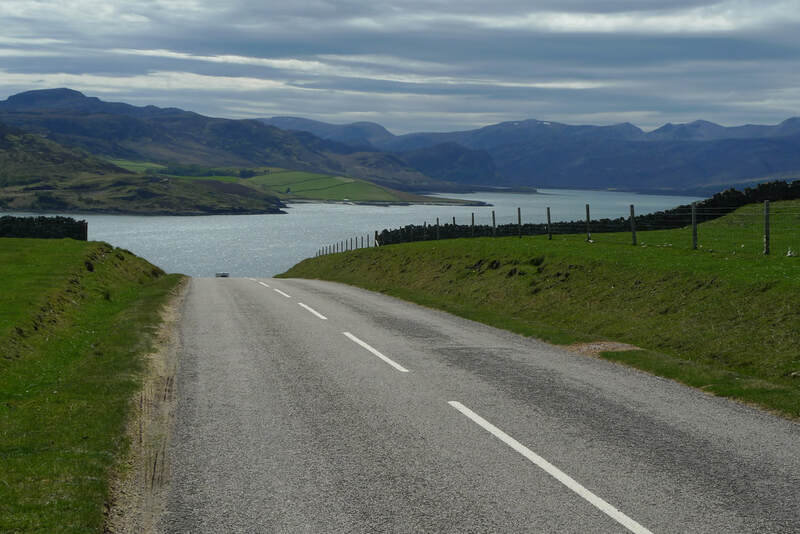 Our destination was Durness, a 40 mile cycle that took us to some of the most spectacular coastal scenery in Scotland. The roads are the A836 and A838 and despite their A-classification are mostly single-track, mostly quiet and delightful for cycling. They require a good level of fitness as there is a steep climb right at the beginning, followed by plenty of ups and downs. There are about 8 miles of moorland before reaching the coast. This is an immense and empty landscape with few signs of human habitation. It can feel monotonous, but for me this is the classic and epic beauty of Sutherland that makes it one of my favourite parts of Scotland. Reaching Coldbackie the effect is similar to emerging from the darkness of a railway tunnel, leaving the moor behind and being presented with a sudden and dramatic vista of deep blue sea. From here to Tongue it was an endless delight of coastal views. We looked enviously at the cold pints being enjoyed in the beer garden of the Tongue Hotel and then crossed the causeway over sparkling water. Over the top of the handlebars we had a cinematic panorama of mountains. There followed another excursion inland where I felt disappointed about leaving the sea for such a barren place. However, a roadside noticeboard revealed that this is a place to appreciate. It is called The Moine and is home to 3 species of heather, red deer and birds like greenshank. Rather more sinister is the presence of carnivorous plants that trap insects with a sticky fluid and then devour them. In this vast place, over 7 miles long, there is only one building. It is abandoned, ruined and roofless. Built as a travellers' refuge in 1830 it conjured images of hardy soles hiking this unforgiving landscape, struck by storms and desperately needing shelter. I stopped to take a closer look, but in doing so I lost Paul. He had been behind me and did not notice that I was at the refuge. I was left alone with the weird, but very artistic graffiti, inside the building. On this bright and warm day this location is breathtaking, with the house looking towards a horizon of mountains. The end of The Moine comes with a fun twisting downhill that arrives at the shores of Loch Hope. 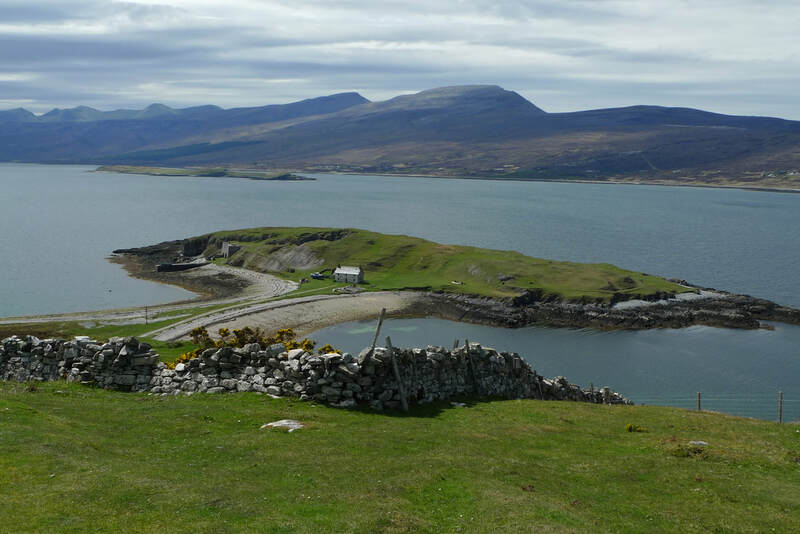 For the remaining 19 miles to Durness it is smile inducing coastal cycling with incredible views, tight curves and a good mix of uphills and downhills. The road comes around Loch Eriboll, which has a distinctive little piece of land that is almost an island, hanging on by a fingertip of sand and pebbles. This is Ard Neackie and the building on it made me very jealous of whoever gets to call this place home. However, it turns out that it is a ruined ferry house; the boat service ended in the 1890s. Small, white and lovely. That's what Eriboll Church is. 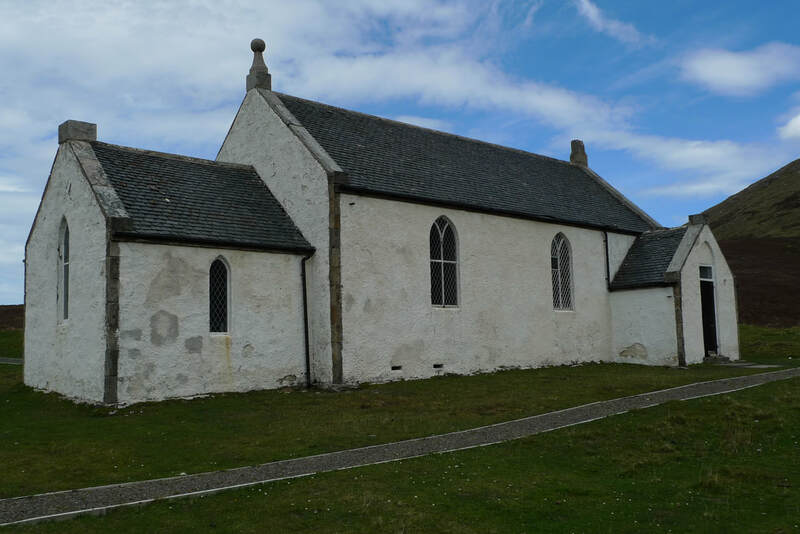 One of those classic Scottish rural churches that has sheep sleeping in its shade The door was locked, but I peeked through a window and could see wood paneling and candelabras. It sits in splendid isolation, far from anywhere, and is one of very few buildings at this loch. A sign on the outside states that it is available for weddings. The ruined township of Ceannabeine was home to 50 people in 1841, but the following year there was nobody left. The families had been cleared from the land to make way for more profitable sheep farming. 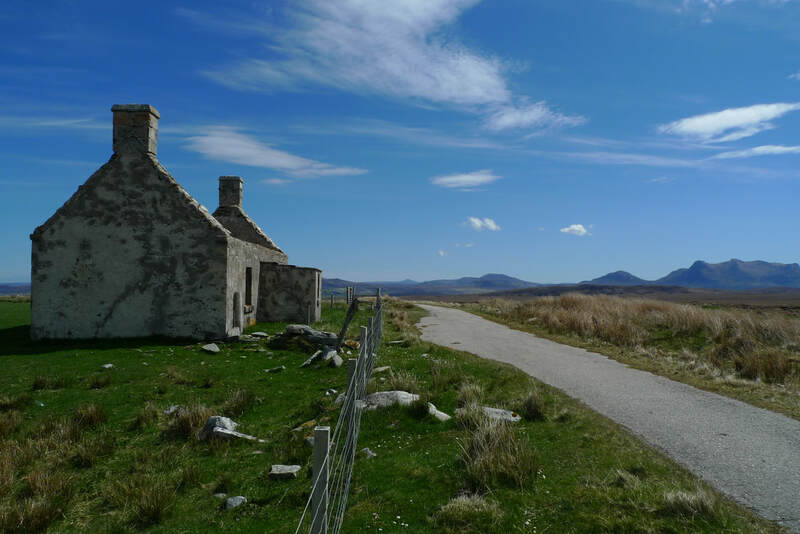 This was the Highland Clearances. There is a trail with interpretive panels that tells the story of the villagers who did not give up without a fight. A woman forced the sheriff's officer to burn the landlord's writ and the police superintendent was chased away. Reinforcements were brought in, but retreated after being attacked by a crowd of 300. Despite the resistance the clearance went ahead after a year's reprieve. The other story of Ceannabeine is how the people had made use of the flora. I was fascinated to read about this on the interpretive panels; plants that I did not give a second thought to had so many uses. Rushes were used to make baskets and mats. The stem could be used to make a candle wick and the pith used to treat soar throats and urinary infections. A plant called self-heal treated wounds and could be brewed into a tea for fever and diarrhea treatment. From sea ivory a dye was created to turn wool into red, orange or yellow. Taking your bicycle this far north requires a bit of pre-planning. You could take the train from Inverness to Kinbrace or Forsinard and cycle from there. You need to book a bicycle space on these trains. There is a summer bus service with a bicycle trailer that travels from Inverness to Durness. 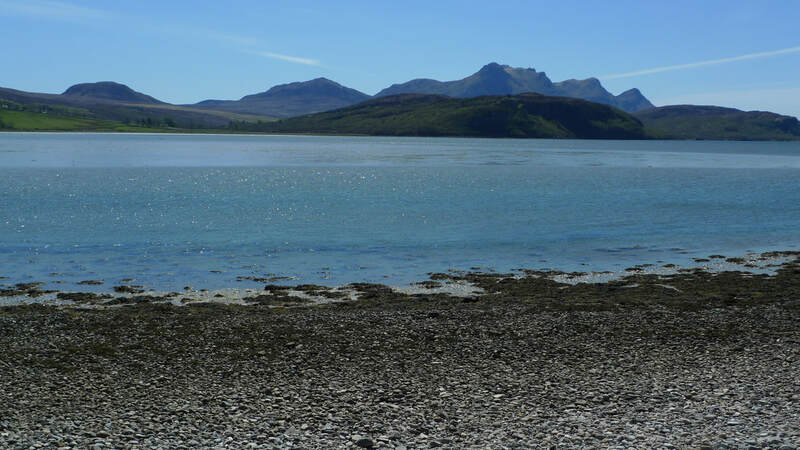 I began this trip at Kildonan station and cycled from there to Bettyhill. You can read about this in my previous travel feature. 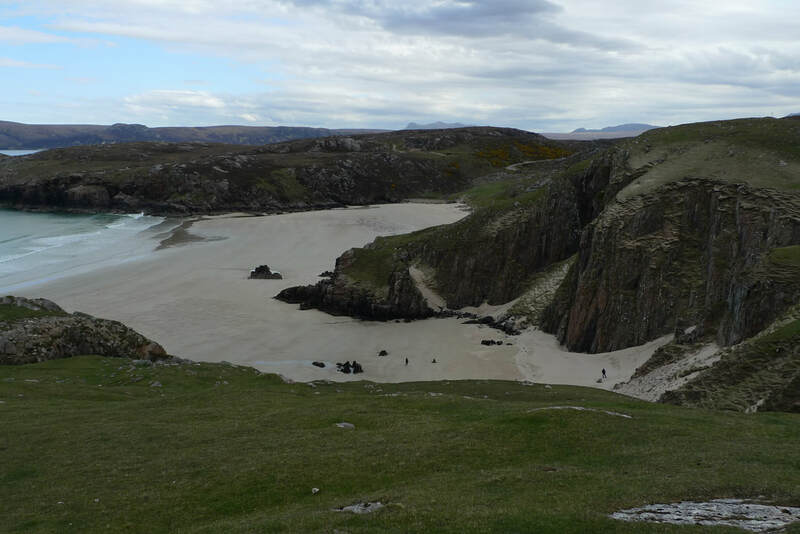 It is about 40 miles from Bettyhill to Durness. It is an A-road, but mostly single-track with passing places. 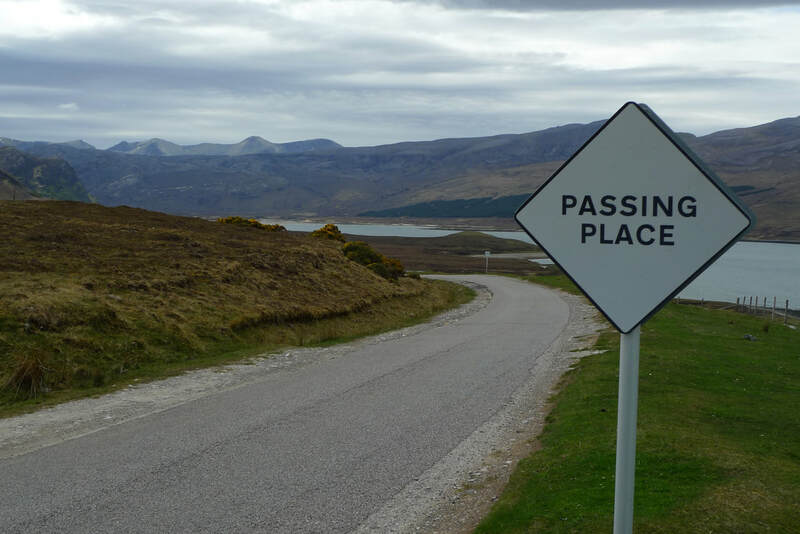 Traffic volume is generally low, but this is on the North Coast 500, Scotland's answer to Route 66. This is an incredibly popular driving route, so don't be surprised if it is sometimes busy. There are plenty of hills on this route, so you might want to hit the gym with personal trainers to build up a good level of fitness. 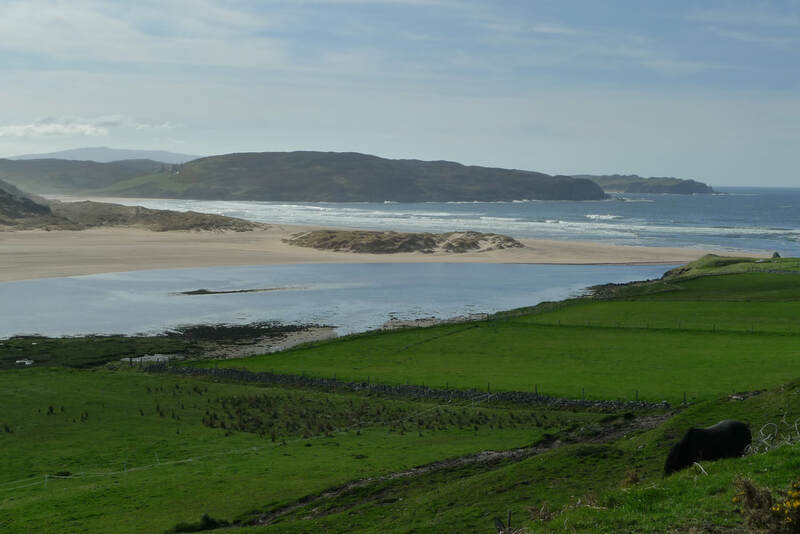 The Bettyhill Hotel is an excellent choice for a place to stay. The views are stunning and the food very good. Between Tongue and Durness there is nowhere for something to eat, so make sure you have supplies with you.